(APN) ATLANTA — Fulton County Superior Court Judge Craig Schwall issued a verbal order–with written ruling forthcoming–on Friday, February 03, 2012, first, evicting Anita and Jim Beaty, Executive Director and Board President of the Metro Atlanta Task Force for the Homeless, by February 15, 2012; second, ordering the United Way of Metropolitan Atlanta to transition hundreds of homeless men out of the shelter; and third, ordering the United Way and homeless men out of the Task Force’s downtown building on Peachtree Street by August 31, 2012. There are numerous problems–both of a factual and legal nature–with Schwall’s ruling, which, of course, have not been covered by any other news agency.About two hundred interested people showed up to attend the Friday hearing, but only some were allowed in. This reporter was able to attend only the second post-recess segment of the hearing. After the judge ordered there would be no cell phones allowed in the relatively small courtroom, about two dozen security guards ordered citizens with phones in a separate line. Many of those who did not follow the orders were allowed in, while many of those who did were not.This reporter, Maria Saporta of the Atlanta Business Chronicle and Saporta Report, and a reporter with WSB, were told we would not be allowed in until after all the non-media “spectators” were let in. “You all are here for a reason. You are here because you’re working,” we were told. Steve Hall, attorney for the Task Force, told Schwall he wanted to present evidence that, as previously reported by Atlanta Progressive News, numerous parties including Central Atlanta Progress, the Atlanta Downtown Improvement District, Manny Fialkow, Emory University, and the City of Atlanta participated in a clear conspiracy to sabotage the Task Force by interfering with their private and public sources of funding. “I want to put up evidence on the legal merits of the [conspiracy] claim, which goes to whether you can grant relief [the dispossessory],” Hall said. tortuous interference with private business relationships. Schwall wanted to know why, if the Beatys were earning 50,000 dollars per year salaries, they were not paying it towards the Task Force’s rent or debts. “What is the purpose of the company?” Schwall asked. “They travel all over the country, they go to meetings,” Hall said. Our Fine Arts These is a tax-exempt, non-profit organization funded primarily by B. Wardlaw. Beaty previously told APN she took herself off the Task Force’s payroll years ago. “I’m glad you corrected me,” Schwall said. Hall raised the concern that Creative Loafing Atlanta blog would echo Schwall’s misrepresentation. “It’s gonna get written up in Mr. [Scott] Henry’s paper,” Hall said. Henry has for years been a consistent source of pro-business community, pro-Mayor Kasim Reed, anti-Task Force propaganda. “You’re correcting him,” Schwall said. “We’ll see if it gets in,” Hall said. “Let’s say I agree it’s [the conspiracy is] all true. Let’s say the United Way comes in… There’s no irreparable harm,” Schwall said. However, Hall disagreed. He said there is extensive case law that says, in circumstances like these, the loss of real property is irreparable harm. Hall is likely to include this argument as part of his appeal. Schwall seems to believe that the Task Force, if they are evicted and do later prevail on their conspiracy claims–in which they are seeking 21 million dollars in damages–that they could simply find another place in the City for their shelter. However, over the last few years the Council has passed numerous Not In My Backyard (NIMBY) ordinances restricting the ability to establish new shelters and supportive housing in the City. The Task Force is not affected by these zoning restrictions in their current location because they are grandfathered in, but this would not continue to be the case if they are evicted on the 15th. “You’re gonna tell me these people did all these things. You still have an adequate remedy at law,” Schwall said, referring to the ability to seek damages. The conspiracy case is being heard in another court by an appointed Special Master, and that issue, while connected, is not before Schwall. However, such there is no one in the City who would have the discretion to waive the City’s current zoning policies. Such a change would have to be approved by the affected Neighborhood Planning Units, the Zoning Review Board, the Council’s Zoning Committee, the Full Council, and the Mayor, which is unlikely; and Hall made the Court aware of that during Friday’s proceedings. In the two years Schwall had stayed the eviction, “What has changed for the better?” he asked. “Thousands of people for off the streets, got housing,” Hall said. “I’ve seen all the [conspiracy] evidence. It’s troubling. Does it rise to tortuous interference?” Schwall asked. “Yes, more than that,” Hall said. “We can agree on one thing. I don’t agree Fialkow is all about helping the homeless,” Schwall said. Hall at one point presented an offer for the Beatys to step aside and retire, and for Carl Hartrampf, who has worked for the Task Force for years, to take over. “The Regional Commission on Homelessness supports… supportive housing, transitional housing, case workers,” a United Way attorney said, impliying the Task Force does not support these things. The Task Force used to provide those things before the City and other parties got together to deprive them of all their funding. Schwall held up the United Way’s blessing, or lack thereof, as if they were angels up in heaven. However, the local United Way was part of the conspiracy to sabotage the Task Force; they did nothing to stop Rufus Terrill’s robot that would spray water on homeless people. As previously reported by APN, United Way in other jurisdictions, such as Aiken County, has come out in support of nuclear power, despite all the harm to the environment and health that nuclear power causes. “Is the United Way willing to put in all the resources necessary,” to help the homeless men at the shelter, Schwall asked. Therefore, the United Way did not guarantee they could help the homeless men on a long-term basis. And even if they can place the current eight hundred residents, there will soon be several hundred more needing help. As previously reported by APN, the Task Force consistently helps many homeless people who have nowhere else to go. Some people are chronically homeless, while others are homeless cyclically or episodically; the Task Force helps them all. “In three months there will be nine hundred more,” Hall said. The United Way has failed to explain why, if they have all these resources and interest in helping homeless people, why they haven’t provided these in the past. The United Way acts as if Anita Beaty is holding the homeless men hostage there at the Task Force. The men are staying there despite the fact that the facility has operated with no paid staff or budget for years. If there was some place better for them to go, surely they would have gone there already. And if the United Way was truly interested in providing new placements, surely they would have done so already. “I’ve approached them. We want help,” Hall noted in Court. “They never made a formal funding request through the normal procedures. They made emergency requests we didn’t see as appropriate,” the United Way attorney said. “I think there’s no irreparable harm, if they’re put somewhere safe and clean. If they [the Beatys] want to retire, what’s the difference?” Schwall said. “I’m not convinced they have the best interests of the homeless in this city. If they did, they wouldn’t be in contested litigation and moved Occupy Atlanta in, which is a political statement. And they would’ve let United Way in. If they can’t do that, it’s about power and control and revenge,” Schwall said. “To suggest my client, who has dedicated her life, who has adopted homeless children, does not have the best interests of the homeless at heart, without having heard from her or talked to her, isn’t in the best interest of this system,” Hall replied. 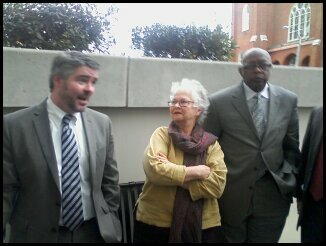 “It’s not a good idea to let Occupy Atlanta move in when a Judge has allowed you to stay with no money,” Schwall said. Hall said he could present evidence that many of the Occupy Atlanta protesters are homeless, as APN and other media outlets have already reported. “They have cell phones and Blackberrys,” Schwall said. “Most homeless people have cell phones,” Hall said. “You have one last chance to step down. I can’t let this go on for two more years. This is the most acrimonious litigation I’ve ever seen in my career,” Schwall said. “What was the purpose of suing Emory and antagonizing a huge pot of money?” Schwall asked. Hall replied that Emory was part of the conspiracy too and they had participated in a meeting with Dan Cathy, founder of Chic-fil-a, to convince him to stop funding the Task Force. Hall said Emory was not willing to help the Task Force. “All this litigation looks like your clients can’t get along with anybody,” Schwall said, adding he believed the Task Force could move somewhere else if they win in their conspiracy claims. “Let’s keep an open mind… not necessarily the same place. There’s got to be many places, warehouses that can be converted,” Schwall said. Ironically, those opposed to the Task Force have criticized them for “warehousing” the homeless for years. “I want to schedule a final hearing either on the dispossessory or the whole case… the opportunity to put up evidence,” Hall said. “The evidence is irrelevant to whether they get to dispossess,” Schwall said. “We have a RICO claim. Why is the relief, we’re gonna take the building and give it to the developer who’s done all these things? Why does he have the higher equity?” Hall asked. But Schwall was unconvinced. He issued his ruling, adding he would file a Certificate of Immediate Review and that he would stay his decision until the Task Force’s appeal could be heard. Such a Certificate asks the appeals court to immediately review Schwall’s decision, even though he appears to be viewing his decision as an interlocutory, as opposed to a final, ruling. After the hearing, Hall said he intended to appeal and that this wasn’t the end, while APN overheard an attorney on the other side saying he believed this was the beginning of the end for the Beatys. In an interview today, Hall told APN he is not sure whether they will be appealing to the Supreme Court of Georgia or the Court of Appeals of Georgia because there are some complex jurisdiction issues involved. Either way, he will be appealing. Hall said that Schwall had previously said in Court that he could see no greater example of irreparable harm than evicting the Task Force; he is not sure what changed, but is likely to bring up the issue on appeal. Hall said the United Way is only prepared to help four hundred men, not the current almost eight hundred, and certainly not any new homeless men who are not currently living at the shelter. Hall said the United Way estimated it would cost them about four million dollars to transition the men out of the Task Force, but he believes the real cost will be closer to eight million dollars. However, the Task Force has been serving the same men with a budget of zero dollars, since their funding was taken away; the Task Force has a program where some homeless men serve as volunteers, help run the shelter, and help as many men as possible find housing. Hall added that, in the six months it will take the United Way to help the current men, an estimated 1,200 to 1,800 men will be denied shelter and forced back out of the streets. Incidentally, the United Way is not actually a party to the case, so it is also not immediately clear how the Court can order them to do anything.